A subacromial decompression aka acromioplasty is an operation performed to treat shoulder impingement. Impingement occurs when soft tissues in the shoulder repeatedly rub against bone causing pain and inflammation, particularly when you raise your arm. The aim of shoulder impingement surgery is to regain full, pain-free range of movement at the shoulder. Surgery for shoulder impingement involves removing any inflammed or tight structres and shaving small amounts of bone off to leave a smooth, wide space. Here we will take a brief look at the causes and symptoms of Shoulder Impingement Syndrome, then we will look at the indications for surgery, what happens during a subacromial decompression and the recovery process, including advice on when you can return to activities. At the top of the shoulder, part of the shoulder blade, known as the acromion, and one of the ligaments, the coracoacromial ligament, join together to form a sort of arch/roof. Underneath this arch is an area known as the subacromial space, through which the rotator cuff tendons pass. 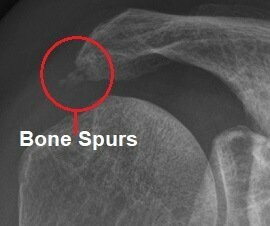 3) Irregularly Shaped Acromion: Some people’s acromion is a slightly different shape e.g. curved or hooked which decreases the subacromial space. Any combination of these leads to increased friction and pressure on the rotator cuff tendons, most notably the supraspinatus tendon, which becomes inflamed further narrowing the subacromial space. A cycle of rubbing and inflammation develops as the condition gets progressively worse. This is known as shoulder impingement syndrome and leads to pain and restricted movement in the arm. With a subacromial decompression, the aim is to increase the subacromial space to eliminate any friction. The most common sign of shoulder impingement is pain as you lift your arm out to the side or put your hand behind your back. 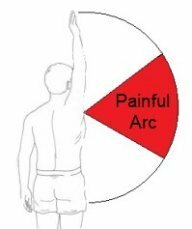 As you lift your arm out, impingement is usually associated with the pattern of a painful arc, where initial movement feels fine but as you lift your arm higher and the subacromial space narrows, the pain builds up. However, once the arm reaches a certain height, the subacromial space actually starts to open up again and pain diminishes. The most painful area tends to be when the arm is just below to just above shoulder height. Depending on pain levels, movement may be restricted. If you would like to more about impingement causes, symptoms and treatment options, visit the shoulder impingement syndrome section. Subacromial decompression surgery is recommended if non-operative treatment, such as exercises and injections have failed or if significant bone spurs have developed on the acromion. A subacromial decompression is usually carried out as a day case, so you shouldn’t need to stay in hospital overnight. In most cases it is done under a general anaesthetic, meaning you are put to sleep. You may also be given a regional nerve block to help limit pain after surgery. In some cases, rather than having a general anaesthetic, a combination of the nerve block and light sedation will be used, meaning you are awake during the operation – you won’t feel any pain during the surgery but you may feel a pulling/tugging sensation. A subacromial decompression is usually performed arthroscopically i.e. keyhole surgery. Three small incisions are made around the shoulder. A tube is inserted into the first hole through which fluid is pumped to expand the shoulder joint so that the surgeon can see better and have better access to the acromion. A narrow, flexible tube with a tiny camera (known as an arthroscope) is fed in through the second hole to allow the surgeon to see inside, either by looking directly through the scope or by projecting the image onto a screen. Specially designed surgical instruments are inserted through the third hole to remove any problem areas of bone and soft tissues that are found. If there is any other damage within the shoulder joint, such as a rotator cuff tear, the surgeon will repair that at the same time. Finally, the excess fluid will be drained from the joint, the instruments removed and the incisions are closed (with plaster strips) and dressed. In some cases, arthroscopic surgery may not be appropriate in which case open surgery will be done. This requires a larger incision so the surgeon can see and access the joint directly. 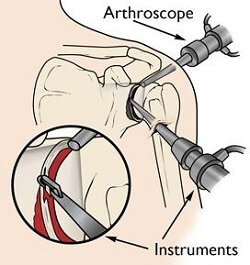 What may start as arthroscopic subacromial decompression surgery may switch to open surgery depending on what the surgeon finds once he can see inside the joint clearly – you will usually be consented for both prior to surgery. Evidence has shown little difference to the long term recovery with either method. If you have had a nerve block with your acromioplasty, you shoulder will be completely numb for around 12-48 hours following surgery which should help you through the worst of the pain. The effects are temporary so don’t worry if you have difficulty moving your arm. Your sensation may be altered due to the numbness so avoid using any heat or ice until the sensation has returned to normal. In some cases, the numbness may spread to your face and neck or you may have pins and needles in your hands. Don’t worry, these are all normal side effects of the nerve block, but if they continue for more than 48 hours, seek advice from the hospital. As the nerve block wears off after your subacromial decompression, you may feel some pain in the shoulder. It is usually advisable to start taking painkillers regularly, taking your first dose at bedtime on the day of surgery and continuing for at least three days. Even if you don’t notice any pain, keep taking the painkillers regularly those first few days so that you stay on top of the pain. If you wait until you have pain to take your painkillers, it is harder to manage the pain as medication can take up to an hour to relieve symptoms. Around three days after your subacromial decompression, you should be able to start reducing the level of medication - your doctor will advise you on what medications to take and how often. Once the nerve block has worn off and you have regained normal sensation, you can use ice packs to help relieve swelling and discomfort, particularly before and after doing your exercises. Wrap a cold pack or bag or frozen peas in a towel and rest over your shoulder for 10 minutes (no longer). It may take a few weeks/months for the pain to settle completely following a subacromial decompression. 2) How Long Do I Use The Sling? If you have had a nerve block with your subacromial decompression you will be given a sling to wear for comfort and to support the arm while it is numb. You don’t have to use it all the time and can take your arm in and out when you want. Most people completely discard it after a few days. It can be helpful to wear it when you are up and about the first few days so that you don’t knock your arm. 3) What Exercises Should I Do? 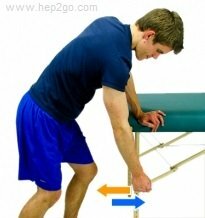 Your physical therapist will start you off with simple exercises as soon as your nerve block has worn off to keep your arm nice and loose – visit the shoulder mobility exercises section for some examples. After a few weeks you will be able to start on strengthening exercises. Remember, it is normal to have pain for a few weeks following subacromial decompression surgery, so don’t let that stop you from doing exercises. Take them gently and time them with your painkillers. You won’t damage your shoulder by doing exercises so don’t be frightened to move your arm, just take it slowly, gradually building up as able. It is better to do short sessions (5-10 minutes) frequently (3-4 times a day) than one longer session. 4) What’s The Most Comfortable Position To Sleep In? This will vary from person to person but here are some ideas that may help. If you like to lie on your side, avoid lying on your operated side initially. Instead, lie on the other side and prop your operated arm on one or two pillows directly in front of your chest. Alternatively you may want to sleep wearing your sling initially to support your arm. If you prefer to sleep on your back, you may find it more comfortable to place a rolled up towel or small pillow underneath your shoulder/upper arm. 5) How Do I Look After The Wounds? In most cases, you won’t have any stitches with an acromioplasty, just small sticker plasters over the incisions. You want to keep the wounds dry for approximately 5-7 days until they have healed, so stick to strip washes initially. 6) Is There Anything I Should Avoid? Remember, you don’t need be afraid to move your arm – you can’t damage the surgery. The best guide is pain – if it hurts, don’t do it. It tends to be activities where the arm is at or above shoulder height, or lying on the operated side that cause pain, so try and avoid those initially until things settle down. You should avoid heavy lifting for around 7-21 days following an acromioplasty. 7) How Quickly Will I Recover? Everyone progresses at different rates following a subacromial decompression. Most people make an excellent recovery but it can take a few months. You should be able to move your arm comfortably below shoulder height within around three weeks and above your head by around six weeks by which stage you should have regained basically full movement in the shoulder. In most cases, recovery takes around six months, but improvements may continue for up to one year. 8) How Successful Is Shoulder Impingement Surgery? Subacromial decompression has an 80% success rate. Remember, it may take up to one year to fully recover and it is important to continue with your exercises until you have regained full strength and movement to get the best outcome. 9) When Can I Return To My Usual Activities? Driving: You can start driving as soon as you feel able to comfortably steer and control the car. In most cases this is around one week. It is a good idea to start with short journeys and you may want to check if there are any restrictions with your motor insurance company. Work: It will depend on the demands of your job. If you have a sedentary job e.g. office work, you can usually return 1 week after subacromial decompression. If however your job requires heavy lifting or working with your arm above your head, you may need to wait around 6 weeks or in some cases longer and you may need to modify your activities the first few weeks. Your doctor or physical therapist will be able to offer advice on when to return. Leisure: Be guided by your shoulder, thinking about your pain levels and the strength and movement in your arm. Always start slowly and gradually build up how much you do. Remember, you may not notice the discomfort until the next day so don’t push yourself too much too fast. For overhead activities such as racket sports, front crawl and certain DIY work you should wait 3 months following acromioplasty. You can return to golf after 6 weeks. 10) Are There Any Risks? Any surgery comes with risks, such as bleeding, blood clot, infection or an unusual reaction to the anaesthetic, but they are rare. Specific risks with subacromial decompression include persistent shoulder pain or a frozen shoulder (5-20%) and damage to surrounding nerves/blood vessels (less than 1%). In a few cases (less than 5%) the surgery may need to be repeated within 10 years. If you notice any discharge from your wound, you develop a temperature or feel unwell, see your doctor as soon as possible. One of the best ways to make a good recovery from a subacromial decompression is to do your exercises regularly. Visit the shoulder mobility exercises section for a range of exercises to get your shoulder moving properly again. If you would like to find out more about impingement and how it occurs, visit the shoulder impingement syndrome section.